Tech Stocks Decline, Will Channel Hold? Thus far, tech stocks, as measured by the ultra 3X ETF, TYH, are declining within the channel I have been watching for several weeks. 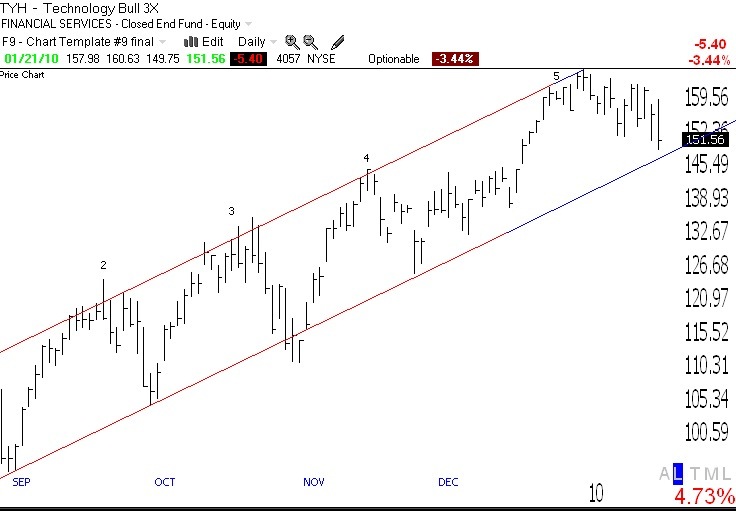 The question, which my stock buddy, Judy, raised when I first posted the channel was, will the bottom of the channel hold as it has in the past? No one knows. The key for me is to wait for the reversal, and to then wade in slowly, with stops below the low of the bounce. Meanwhile, the Worden T2108 Indicator is now in neutral territory, at 58%. Only 19% of the NASDAQ 100 stocks have a MACD that is above its signal line, the lowest percentage since last November’s decline. The low in this indicator last November was 9%. The key for me is to remain defensive, and to cut losses before they grow too large. NASDAQ 100 Index Still in Up-trend; QLD and TYH beat most NASDAQ 100 stocks again! Are we looking at the same TYH chart? Yahoo! shows top of 4 at $170 above top of 5 at $165. TYH couldn’t break through previous high. TYH paid out capital gains in late November and some chart services have not adjusted their charts. I believe that is the reason for any discrepancies.